I think this initiative to provide independent objective information on innovative new medical technologies from the National Institute for Health and Care Excellence (NICE) is stunning and I think it has the potential to add lots of value to App Store discovery of mHealth services (eg. ‘only show apps that have a NICE MIB’), to help Clinicians feel more confident adopting and prescribing mHealth services to their Patients and to help Patients who are bringing mHealth innovations with them to their Doctor appointments (eg. “here’s the NICE MIB for this device I bought in the Apple Store and have been using for the last 6 months“). 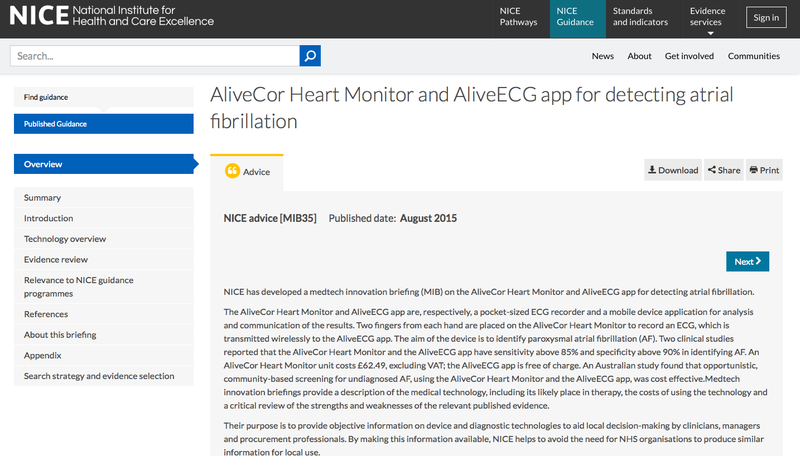 It’s no surprise to me that Alivecor is once again blazing this trail (read about my experience using this device with Patients back in 2011) but I really hope that NHS England continue to commission these briefings as together with a commitment to supporting the training of Clinicians they could make a huge contribution to adoption of quality mHealth innovations and help ensure Clinicians and Patients aren’t investing their valuable time trying to find value in the plethora of dead-end concepts and gadgets that are increasingly being backed by exuberant press releases and exaggerated advertising.